Full title: Crosschapel through the years : a souvenir book celebrating 150th anniversary 1861-2011. Publisher / Place of Publication: Church of Our Lady of Mercy / Crosschapel, Blessington, Co. Wicklow, Ireland. About: The title says it all. This is a gorgeous and high-quality memento of the local church at Crosschapel. If only every congregation would produce such a record of their place of worship. Chapters: Crosschapel — Burgage — The first Parish Priest — Rebellion of 1798 — The Chapel plans — List of Parish Priests — Derivation of names — Visitations by the Bishop — The Parochial House — The New Church — Repairs to the Church — A protected structure — Present day parishioners — Gallery of old photographs — Internal features — Christ of the Blessington Lakes. WW Connection #1: A wholly local enterprise. Authored and printed in the parish of Blessington. Extra #1: Contains illustrations on every page. Most are full colour. Publisher / Place of Publication: [Knockananna Church] / Knockananna, Co. Wicklow. About: A commemorative booklet which sets out the order of service for the Mass celebrating the opening of the local church in 1978. 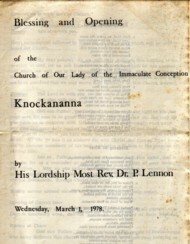 Extra #1: Link to Knockananna Church information via the Hacketstown Parish website. Extra #2: Check Libraries Ireland for this booklet. About: A handsomely-produced booklet that uses ‘The Gathering Ireland 2013’ nationwide event as the focus for looking back at Kiltegan and aspects of its history. The booklet mainly contains short articles of 1-2 pages mostly written by Mary Hickson although several other people have contributed pieces as well. 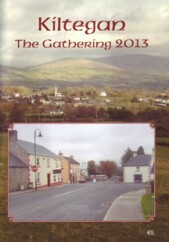 WW Connection #1: Apart from the subject matter, the booklet was printed in Baltinglass. Chapters: Kiltegan – your own place — Kiltegan Village — Early Kiltegan — The Hume connection with Kiltegan — Kilranelagh – Talbotstown — Michael Dwyer — Bicentenary of Saint Peter’s Church, Kiltegan (1806-2006) — Church of the Assumption, Tynock — St. Brigid’s Church, Talbotstown — Naomh Treasa National School, Tynock — Scoil Naomh Bríd, Talbotstown — St. Peter’s National School, Kiltegan — Memories of walking home from Tynock School in the 1960’s — St. Patrick’s Missionary Society, High Park — Slí an Chroí — The Kiltegan Village People (listing those living 70-80 years ago, 50 years ago and 25 years ago) — Kiltegan Village Crossroads — Kiltegan GAA Club — Kiltegan Camogie Club — Two Great Gaels — Kiltegan ICA — St. Tegan’s Hall — Kiltegan Drama — Set Dancing — St. Peter’s Parish Centre — Hill walking in the Kiltegan area — Emigration from Kiltegan — The human face of the recession — ‘Gathering’ Calendar of events 2013 — Bibliography. Extra #1: includes numerous full colour & black/white photographs. 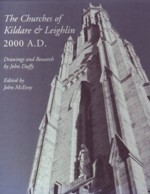 Full title: The churches of Kildare and Leighlin 2000 a.d. Creator / Author: Drawings and research by John Duffy. Edited by John McEvoy. Publisher / Place of Publication: Éditions du Signe / 1 Rue Alfred Kastler, 67038 Strasbourg, Cedex 2 – France. About: A profusely illustrated catalogue of every church in use in the Catholic Diocese of Kildare and Leighlin in the year 2000. Each drawing is accompanied by a potted history of the building. 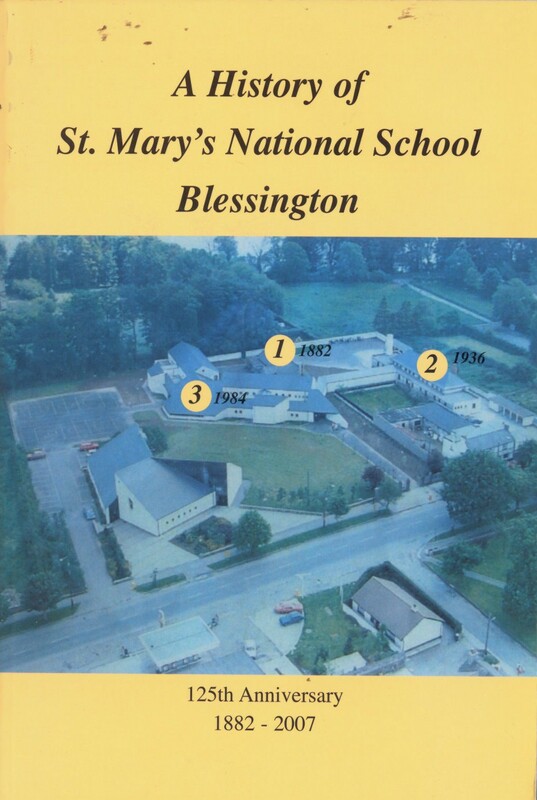 Chapters: Introduction– The history of church buildings in Kildare & Leighlin — John Duffy biography — The history of the diocese of Kildare & Leighlin — Carlow Deanery — Tullow Deanery — Borris Deanery — Portlaoise Deanery — Portarlington Deanery — Kildare Deanery — Naas Deanery — Specially Featured: Carlow College and St. Mary’s Knockbeg — Early history of the diocese of Leighlin — St. Patrick’s Missionary Society, Kiltegan — Religious orders and congregations — Leighlin Cathedral (Church of Ireland) — Early history of the diocese of Kildare — Kildare Cathedral (Church of Ireland) — Bibiliography and Index. WW Connection #1: Many of the churches within the Deanery of Tullow are located in the West Wicklow area. Extra #1: Contains illustrations on every page. Contains many location maps.